Special provision funding is for local authorities to create places for pupils with special educational needs and disabilities (SEND), and to improve facilities for them in mainstream and special schools, nurseries, colleges and other education providers. In March 2017, allocations of £215m of funding for 2018 to 2021 were announced. In May 2018 a further £50m and in December 2018, a further £100m was announced. The additional funding will be paid in 2019 to 2020. This report summarises existing evidence on flexible working practices in schools. It highlights experiences and perceptions of flexible working, and potential barriers and enablers. The review includes case studies taken from international schooling examples, as well as examples from other sectors. The Department for Education uses the school snapshot survey to collect data about how policies are working and what senior leaders and classroom teachers think of them. This analysis was carried out in 2018 to understand the perceptions of those who participated on projects funded by the Leadership Equality and Diversity Fund in 2016 to 2017 and 2017 to 2018. It provides insight into how well participants felt the programme helped them to increase their confidence, develop their leadership style, and achieve next-stage promotions. Quantitative and qualitative techniques were used to analyse the survey responses. This analysis helps to understand the views of those who took part in projects funded by the Targeted Support Fund in 2017 to 2018. It looks at how participants felt the programmes increased their confidence, developed their leadership style, and helped them achieve promotions. This document provides technical information on the new insolvency regime for further education bodies, and general guidance on how to reduce the risk of insolvency through good financial management. 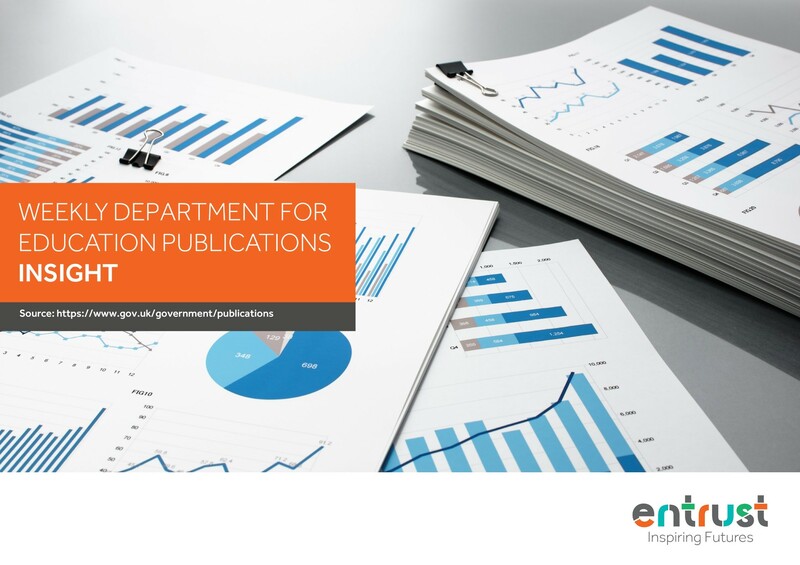 It is primarily aimed at governors but should be also useful for college finance directors and other senior staff. Revised results for key stage 2 at national, regional and local authority level. Results are also broken down by pupil characteristics. The publication also includes figures on pupils’ progress between key stage 1 and key stage 2. Figures update provisional figures released on 28 September 2018. Data on the performance of multi-academy trusts (MATs) based on measures of progress for MATs with 3 or more academies that have been with the MAT for at least 3 full academic years and have results in the 2018 school performance tables. Information on the national deals available to schools to help them save money on some of the things they buy regularly. Monthly apprenticeship starts information for the first 4 months of the 2018 to 2019 academic year are also presented (reported to January 2019). Details of the capital funding that free schools, UTCs and studio schools have received from the Education and Skills Funding Agency. Capital funding is used to buy and rent land, and build and refurbish school buildings. This technical note provides information to help the School Teachers’ Review Body (STRB), school leaders, governors and academy trusts, researchers and others understand costs for schools in England, at the national level, in the short to medium term. The memorandum of understanding document sets out the agreement the Department for Education (DfE) reached with Ofsted and the approved inspectorate of independent schools. It explains how Ofsted will monitor and report on the independent inspectorate’s work. The letter to the Independent Schools Inspectorate (ISI) outlines the agreement DfE reached with ISI. Preparations that schools should be making to get ready for the UK leaving the EU on 29 March 2019. Preparations that organisations and businesses should be making to get ready for the UK leaving in the EU on 29 March 2019. This technical guidance is for awarding organisations. It sets out the requirements that core maths qualifications must meet to be included in the 2020 performance tables.